Since we have not had an opportunity to make our own Stations of the Cross (I just love the sets that were made by Ruth, Angela, and Kimberlee! 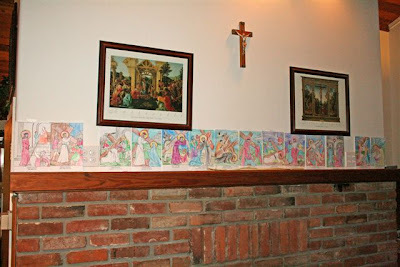 ), my children asked today if they could at least color the Stations and line them up on our mantel. 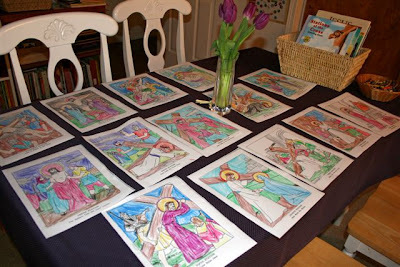 While they colored, we listened to The Passion for Children, and then I read a few stories to catch us up on our Jesus Tree. I was amazed at their dedication, and in no time they had all 14 completed! I had a good Lent season following your blogs while I'm at work. Thank you for all the posts. Congrats on the Easter Hope challenge collections. I wish you and your lovely Family a Blessed Good Friday and a Happy Easter. Gob Bless you and all your loved ones. Mary ~ Thanks for saying hello, and I hope you have a blessed Good Friday and Happy Easter as well! We "just" got started on our Grotto kit. It is a lot of work. I am thinking of color sheets for my younger ones. and maybe gluing rocks once the grottos are made for the littles. I always like to see what you've put on your mantle. I too loved Ruth's idea. We made few sets last week. We gave the extra sets to Godparents.